Although lead has been banned in U.S. drinking water infrastructure since 1986, it is still present in older lead-soldered copper and cast iron lines serving schools and other buildings. Lead can also be present in some indoor plumbing, solder, and fixtures at older schools, including high-lead brass faucets and in some drinking water fountains. Since 2015, national attention has been focused on Flint, Michigan, but reports of high levels of lead in school drinking water continue to appear in the news. We’ve written about Keeping the Lead out of Drinking Water in Flint and elsewhere when utilities change their drinking water source or treatment practices, such as inadequate corrosion control and switching from chlorine to chloramine disinfection. This article highlights recent efforts to confront the legacy of lead in school drinking water. Sticking with Michigan, following a September 2018 shut-down of drinking water in Detroit public schools as a result of high lead and copper test results, the proposed cost of adding permanent water fountains fitted with point of use filters is over $2 million. An estimated $20 million would be needed to repair or replace their plumbing. And that’s just one U.S. school district. Children are most susceptible to the effects of lead, and some scientists believe there is no safe threshold level of exposure. This is because their bodies are still developing and tend to absorb more lead from water and the environment than adults. There is no federal law that requires schools to test for lead in drinking water, but an increasing number of states require or provide funding for testing, communicating results to affected communities, and in some cases—taking steps to reduce lead. Therefore, most school lead in drinking water testing and reporting programs are voluntary. 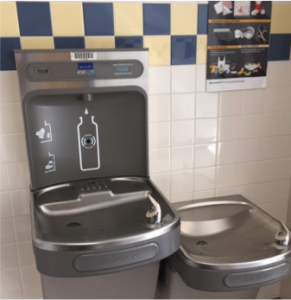 According to the 2018 GAO report, of the estimated 43% of U.S. school districts that tested for lead in their drinking water, an estimated 37% found elevated lead above a threshold level.2 All of these school districts reported taking steps to reduce or eliminate exposure to lead such as replacing water fountains, installing filters, or providing bottled water.3 The report recommends that the U.S. Environmental Protection Agency (EPA) update and clarify its guidance on how schools should determine lead levels requiring action, and expand its collaboration with the U.S. Department of Education to encourage and support further lead testing. Population lead exposures have been significantly reduced following government actions, such as eliminating lead from paint and gasoline and banning high-lead brass fixtures, leaded pipes, and leaded pipe solders. However, removing remaining lead from school drinking water is a daunting public health challenge and will not be possible without greatly expanded federal and state resources. It must begin with expanded lead testing and improved communications, cooperation, and trust. Chris Wiant, M.P.H., Ph.D., is president and CEO of the Caring for Colorado Foundation. He is also chair of the Water Quality & Health Council and a member of the National Drinking Water Advisory Council. Bruce K. Bernard, PhD, is President of SRA Consulting, Inc., Associate Editor of the International Journal of Toxicology, and lives in Cambridge, MD. 1 K-12 EDUCATION: Lead Testing of School Drinking Water Would Benefit from Improved Federal Guidance. https://www.gao.gov/products/GAO-18-382. 2 Threshold or ”action” levels used by participating districts varied from a low of 1 µg/L (1 part per billion or ppb) to a high of 20 ppb. The current EPA action level of 15 ppb for lead in drinking water is based on corrosion control. https://www.epa.gov/ground-water-and-drinking-water/national-primary-drinking-water-regulations#seven. 3 The safety of bottled water is regulated by the U.S. Food and Drug Administration (FDA).